The U.S. universities application process is different from those of others countries, so having an idea about what goes on after one’s graduate school application is submitted is helpful. This way you would know what to expect during the process and the time it would take to receive admission decision. One of the previous articles about how graduate school application is reviewed will give you an idea on what major factors are considered by U.S. universities when admitting new students. Even though the flow chat is from San Francisco State University (SFSU), this admission process also applies to any U.S. university as well as any college/university departments. As you can see, when an international student submits an application, it normally first reaches the graduate school admission office. There are some universities that will ask students to send the college application packet directly to the concerned department, as in SFSU. In such cases, you have to submit 2 application packets for the same university (one for the department and another for the grad school). An application will be denied by the graduate school even before department gets to review your package. If all the documents were submitted, along with other requirements, then application will be forwarded to the department for review. If university doesn’t receive any application fee, they will not start the application processing. It’s always good to pay via credit card to speedup the process. The computer science department at a university will evaluate applications from candidates. If the department feels that the student doesn’t have adequate academic credentials, admission will be denied. There are some instances when students with bachelor’s degrees, for example, in electrical engineering, who applied to take M.S. in computer science and have good credentials, will be conditional admission status, where they must take a few pre-requisite courses, before taking actual M.S. courses. 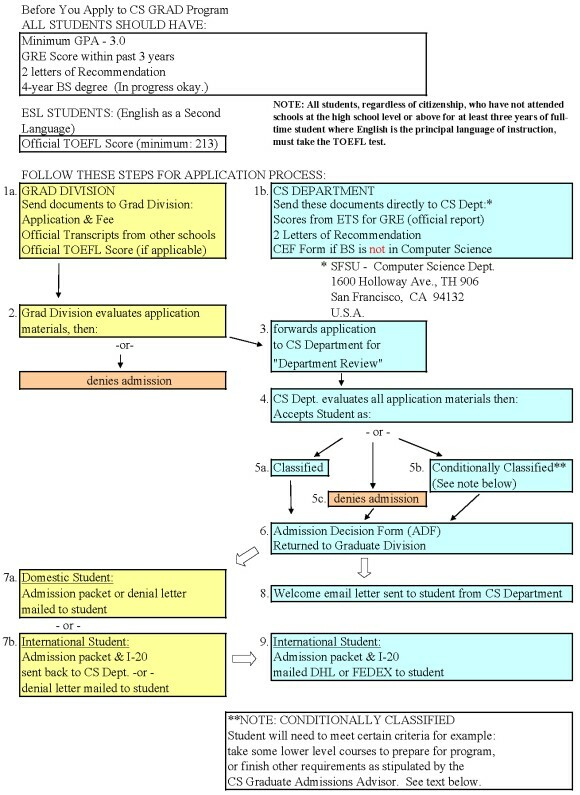 Every university in the U.S has slightly different admission process, but the above flowchart gives a general idea on how international students are admitted to a program. However, the actual factors that each university uses to grant admission might vary, but the flow of documents will almost be the same. The above chart doesn’t show what happens after a department sends the acceptance form to the graduate school. When the graduate school at a university receives the acceptance letter from the department, the bank statements in the student application and other details will be forwarded to the international office, which will then issue a new I-20 to the student. Some schools will mail the acceptance letter and I-20 only through regular mail (not FedEx or DHL courier service), so it will take 2 to 4 weeks to reach new students from the different parts of the world. If you have additional questions, do leave a comment below or read the related posts below. i will like to know if GRE is compulsory for international students who already have a bachelor degree but seek to apply for a masters degree. i am from Mumbai unviersity..My whole engineering aggregate is 59.82%……..am I eligible for applying for MS? i got a score of 880,toefl yet to write i hav an acads of 73 do i have a chance of getting a admission in relatively good college with sufficient funding or is it better to write the gre once again taking new pattern..!! can i get i20 without toefl score as i would get toefl score later. Hello, I've applied for 4 universities in Jan 2011 but I didn't get any admit responses , what should I do sir!!!!!!!!!!! please let me know about the phd after btech.i am in my fourth year btech biotech course from amity university.i have a cgpa of 6.5 throughout.what is the procedure to apply for the direct phd.ihavee good aptitude for reseach and completed a project on biodegradable plastic.what would be the cost and duration of phd?will i get any funding? I have applied to 7 universities and expecting one I-20 soon. I am planning to go for Spring 2011. I just wanted to know when can I go for VISA, i mean how late can I plan. Classes might start from 2nd week of Jan 2011. I ve applied to oakland univ and my application has been processed this week but when I checked the status online,the final decision has not been indicated.So will they send me the decision through mail?and if I ve been admitted,will the I 20 be sent with it?Also how late can I apply for visa if I am waiting for a particular university's decision? i scored 1120 in gre and 101 in toefl .i wanna do ms in pharmaceutics . an official transcript is a document similar to your marksheets wherein all the semester marks are arranged one after the other.Transcripts are of two types college transcript which can be obtained from your college usually cheaper and second is the university transcript which can be obtained from your university which is usually costlier.Most american universities accept college transcripts. do u know if a university with international ranking about 380, does it have scholarship or funding as well as those university with ranking under 100?! I did B.sc.Medical Microbiology from Doon,India.The course duration was of 3 and half years;half year includes literally internship ..Your chart above shows minimum criteria needed to be admitted in U.S.A university for P.G is 4 yrs.So,what should i do?Is my dream of studying in America over or should i be doing SAT instead of GRE cuz it's sure that I will be sent in U.G class for year to fulfill their credit requirements…plz help me what should i do?, I have completely no idea about this and i am giving gre this Nov. I am homeopathic doctor. My qualification is BHMS( Bachelor in homeopathic medicine and surgery) 51/2 years, and i have completed my MD, 3 years course. Now I want to study biotechnology masters in a good US or canada university. I have read somewhere that if you plan to apply for a masters in any subject, it has to studied in the undergraduate course. Is it true? If it’s true, is it possible for me to makeup the deficit by attending core courses offered by the same university? I have completed my B.Tech in Electronics and communication in 2008.Then I worked in TCS for 1 year and 3months.I have a CGPA of 7.77.I want to pusue M.S in nanotechnology in a good US university.What are the minimum score I required to get admission in a good or high profile university. I gave my GRE with 1180 my Gpa is 60% can u suggest how i should apply. I am major in Electrical. I am from Jordan, I want pursue MSN in USA. My persentage of bachelor is 65.4%. I do not know how much that in GPA system, in addition, Is there hope to reach my dream. Probably you will get scholarship.But you have to try more and more. i am pursuing B.E in electrical and electronics engg. studing in third year and i want to do master's in electical engg. kindly give me necessary informations regarding GRE and TOFEL and how to do the preparation. From many senior students I have come to know that, it’s better to apply for Fall semster rather than a Spring semester. This is so because of some good courses offered in Fall only, better financial aid chances etc. Is this right saying?? Please provide me some guidance with suggestions on this issue. I have completed my graduation in Computer Science. My GPA is 2.9 but my GRE score is 1380 and tofel score is 110 . Is there any possibility of getting myself admitted into any US graduate school for a MS/Phd ??? I have some publications on my subject. I have a desire to get a Phd but is it possible with such a poor GPA?? I will be grateful to you if you inform me on this. @Essam albooq: You will have to apply to U.S. schools. There are schools that give admission without GRE score, but majority of the schools require GRE scores for admission. So, admission to U.S. University depends on where you apply. I would like to inform you that I have been nominated for the candidacy to receive a full educational scholarship for master degree in the field of engineering management from ministry of high education In Saudi Arabia. The scholarship will cover tuition fess for the ESL intensive study and the related study that I am going to be admitted in. In the same time, the scholarship will cover the books, medical insurance and living expenses which will be in monthly based payment. In this moment, the sponsor requires either full admission or conditional admission to finish the final processing of the scholarship. Upon this issue, I would like to have a conditional admission since I have to go to the English program to achieve the requirement of the TOFL score during my intensive English course. Please inform me about the possibility to have the conditional admission in this moment since the time is the main concern to me. Thank you very much and appreciate your help.